Welcome to the review of GovMetric data. We are looking at both October and November 2011, following the Christmas break. 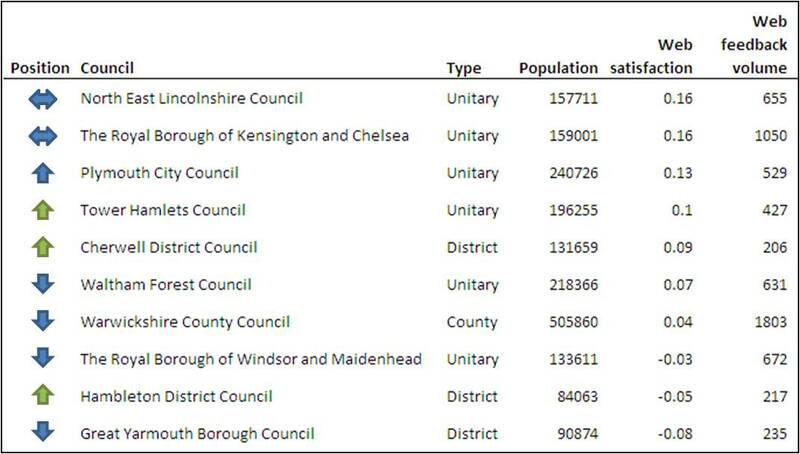 This index is based on aggregated data from 70 UK councils, gathered monthly through www.govmetric.com. 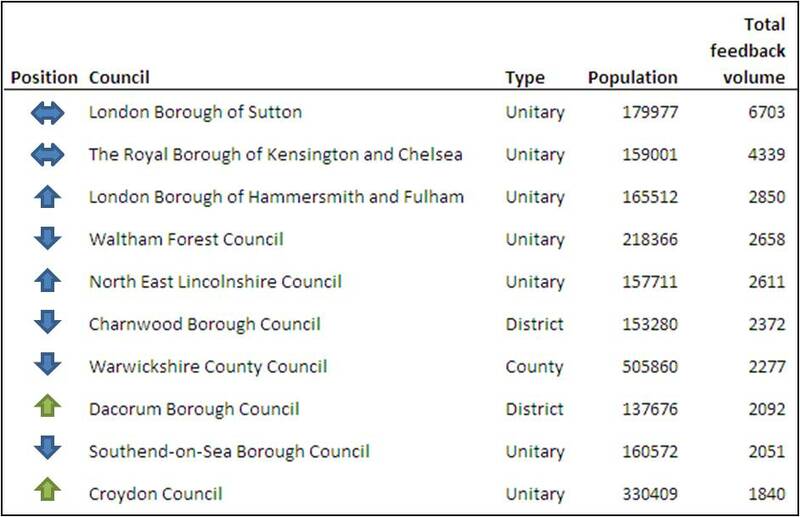 Nearly 30,000 pieces of feedback were collected by the Top 10 councils this month. Post Office Ltd is the largest retail and financial services chain in the UK – bigger than all of the UK’s banks and building societies put together. 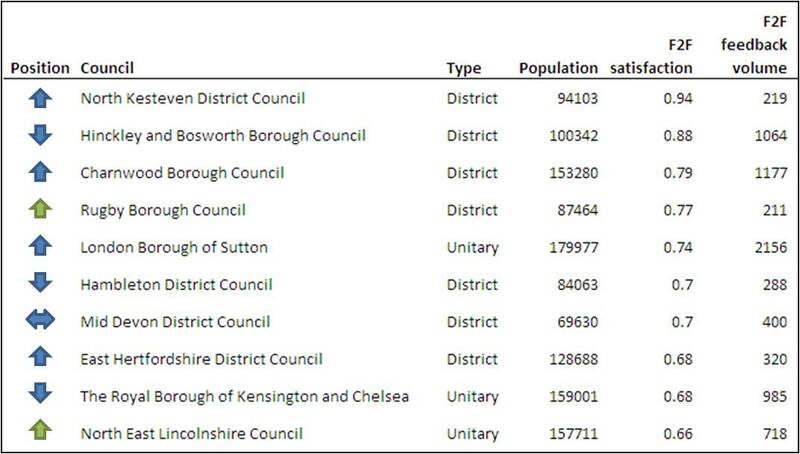 Considered to be vital community assets in both urban and rural areas, 99% of the UK population is within 3 miles their nearest Post Office, and 90% is within 1 mile. But with the mail market in decline, the government is encouraging the Post Office to expand its financial and government services. This will include more local authority involvement in the planning, delivery and level of post office service provision, and further developing the Post Office network as a Front Office for the government at both the national and local level. More details about the proposals can be found here. In other countries, local government services are provided through post offices to good effect. These include the payment of childcare fees in Australia, applications for disabled parking permits in Italy and pre-paid city and airport parking in Ireland. Post offices in Switzerland are hubs for local government information, notices and newsletters and post offices in Ireland display local authority planning department information. 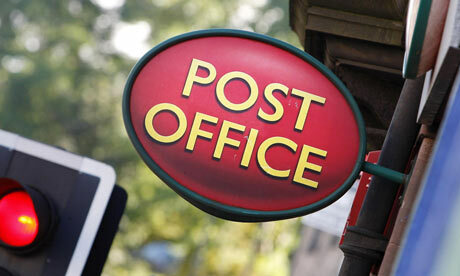 In the UK, over 300 councils already use the Post Office for delivering some services. There are potential benefits for both sides. For the Post Office, it will help to secure the financial viability of the network; for local councils, it presents the opportunity to deliver services through a wide-reaching, well-trusted channel while also achieving significant cost savings. Older, poorer and other vulnerable citizens (who regularly use post offices and do not always have access to online services) will also benefit; the Post Office network includes 1,500 branches offering services in deprived urban neighbourhoods, and in many rural areas the local Post Office is the sole retail and financial services provider. Identity checking and verification – customer relationship management, enrolment, change in circumstances. Below are some recent and forthcoming pilots and projects. In September 2011, the Post Office signed a contract to provide through its branches a suite of managed services on behalf of Westminster City Council. The first two services to go live were parking penalty charge payments and applications for resident parking permits. Other services to be offered through Post Office branches will be casual parking scratch cards, casual trader vouchers, ordering commercial waste bags and collection as well as Business rate and Council tax payment. Last September, Ed Davey (Minister for Employment Relations, Consumer and Postal Affairs) announced that 25 councils would be invited to explore a partnership with the Post Office similar to that in place with Westminster City Council. 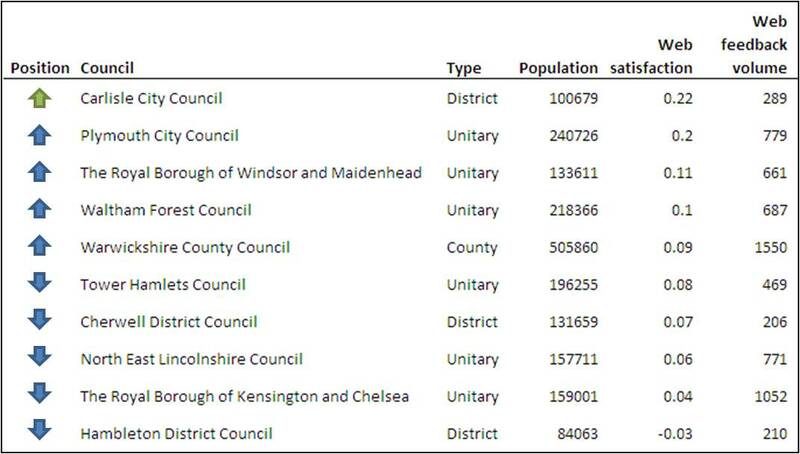 One of these was Rydale District Council. 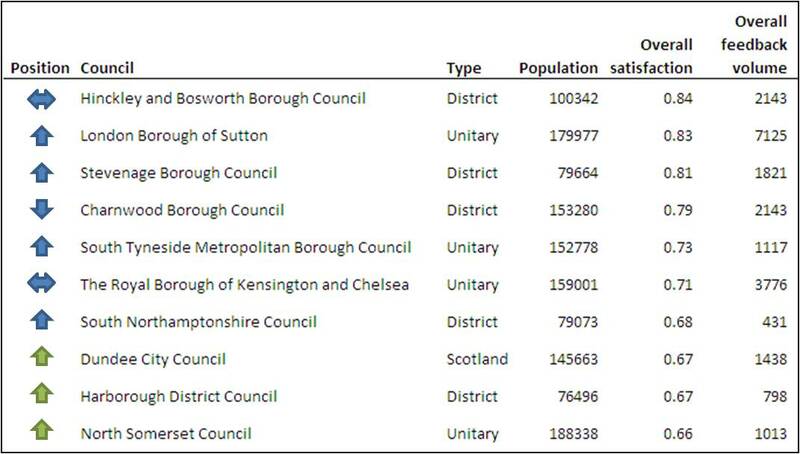 The council was already reviewing post offices in its district to pre-empt threatened closures when the Royal Mail Group approached it. The authority has been asked to work with Post Office Ltd and the Department for Business, Innovation and Skills to help shape the future of the network. The partnership will see the authority discuss how more of its services can be offered through local post offices. In November 2010, Sheffield City Council, the Post Office and the National Federation of Subpostmasters began a pilot to make Post Office branches a front office of Government and public services across the city. Building on the 700,000 transactions Post Office already carries out on behalf of the council, the pilot was designed to improve access to local public services through Post Offices whilst increasing Post Office sustainability. The pilot is now being evaluated and early findings are positive. 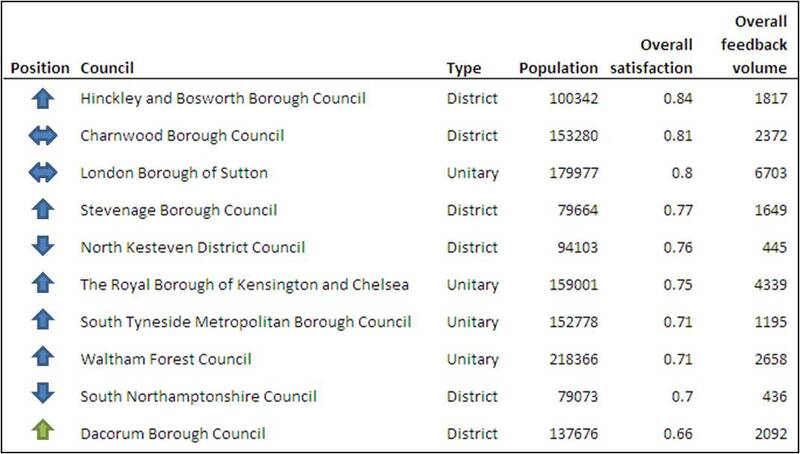 Does your council offer services through local Post Offices? Have you got any plans to expand this over the next 12 months? 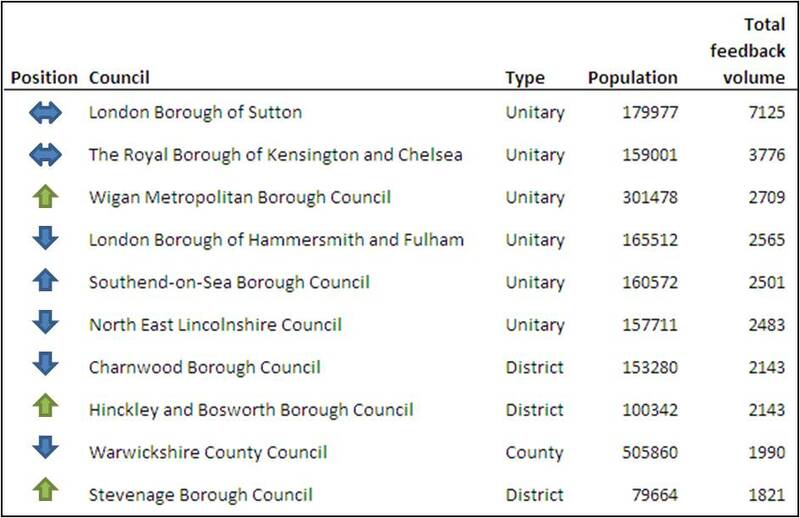 Perhaps you are you one of the 25 councils that has been approached to form partnerships? We would love to hear from you. 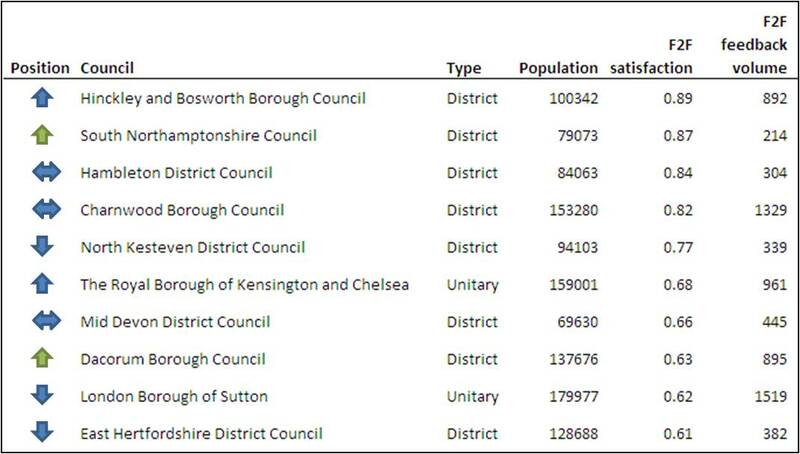 This is where we take a look at the two key charts from the national trends data – channel ratios and service volume trends for UK councils in the sample. No significant changes this month. 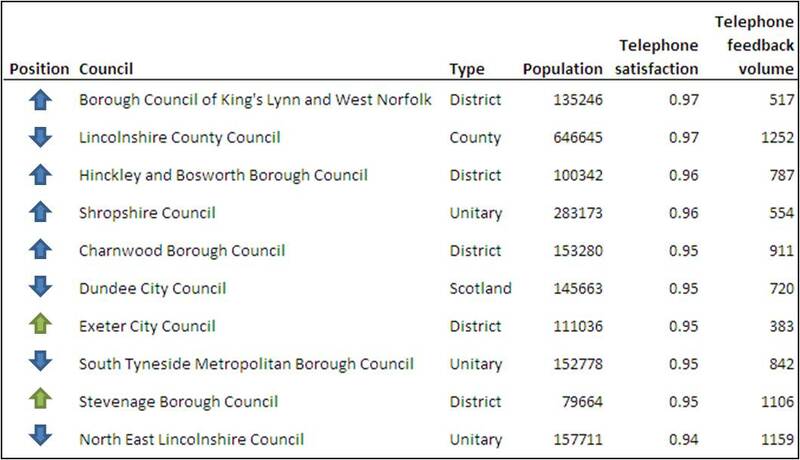 The arrows indicate the council’s position on the chart compared to the previous month’s results. Data is sourced from www.govmetric.com. GovMetric is a customer experience measurement service that enables you to listen to the Voice of the Customer across all contact channels, to prioritise which areas to improve and to measure improvements through near real-time reporting. 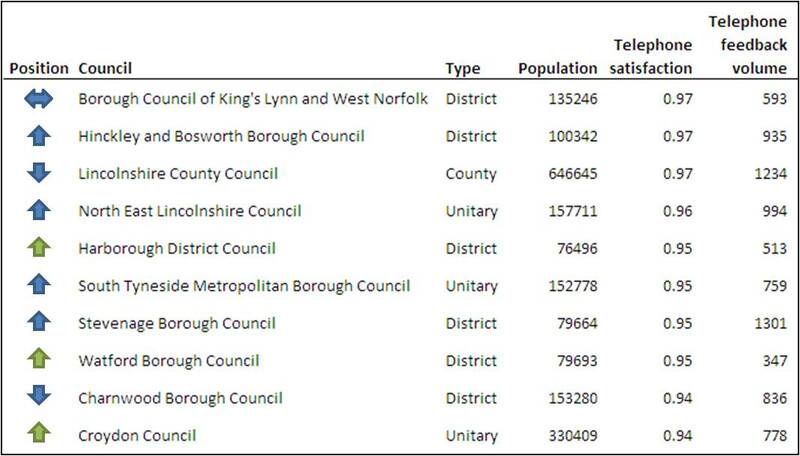 As the data used is a fixed snapshot taken at the end of each month there may be minor variances to the data seen in GovMetric reporting due to final data updates after the end of the month, mapping updates etc. For a demo of how GovMetric works please visit http://www.govmetric.com/demo. Make sure you have volume turned on!